Former Egyptian president Hosni Mubarak was released from prison August 22, 2013, adding another potentially complicating element to the country's ongoing turmoil. A helicopter picked up 85-year-old Mubarak at Cairo's Tora prison and flew him to a military hospital near the capital, where he will be placed under house arrest. He was placed under house arrest according to an order Wednesday by Egypt's military-installoed prime minister. Mubarak still faced trial on murder and corruption charges linked to his 30 years in power, including charges that he failed to stop the killing of protesters during the 2011 uprising that ended his rule. He was convicted on the charges and sentenced to life in prison on June 2, 2012. But in January 2013 a court ordered a retrial, which was under way when a Cairo court ordered his conditional release. On August 19, 2013 an Egyptian court cleared Mubarak of charges that he and his sons stole public money for presidential palaces. On 19 June 2012, conflicting reports emerged about the fate of Hosni Mubarak. The initial reports were that former Egyptian President Hosni Mubarak had been declared clinically dead by his doctors at the age of 84 after suffering a stroke in prison late the night before. The state news agency MENA reported that his heart had stopped beating and he had not responded to several attempts to restart it using a defibrillator. Reuters subsequently reported that sources had told them that Mubarak was in fact only unconscious and on a respirator. Mubarak's health had reportedly been deteriorating since he was put on trial for crimes committed during the protests in early 2011. By 20 June 2012, the reports had been clarified to explain that doctors had declared Mubarak clinically dead, though he had been placed on life support and continued to breath using a respirator. The military had determined that it was still too soon to make a final declaration on Mubarak's fate. Later reports on 20 June 2012, citing Mubarak's lawyer, suggested that he had slipped and fallen in a bathroom and needed to be hospitalized for the resulting head injury. The varying accounts of Mubarak's condition have raised suspicions that the move was not medically necessary, but just rather used to get him out of prison. Mubarak had ruled Egypt for almost 30 years until he was swept from power in an 18-day wave of mass protests in February 2011. Muhammad Hosni Said Mubarak was born on May 4, 1928, in a small village of Kafr El-Meselha. His father owned a small plot of land and also worked in a legal department of the province. He decided to join the Egyptian Military Academy, one of the top universities in Egypt. With a Bachelor's degree in Military Sciences and the rank of lieutenant, Hosni Mubarak entered the Air Force Academy where only top graduates of the Egyptian Military Academy were admitted. Hosni was the best in his year. By age 31, Hosni Mubarak became a base commander. To develop skills in flying Il-28 bombers he was sent to the USSR for training. He went to the Soviet Union for the second time in 1964 to receive the training of piloting Tu-16 heavy bombers. In 1969, Egypt's President Gamal Abdel Nasser appointed him Chief of Staff of the Egyptian Air Force. Nasser was Hosni Mubarak's idol, and Mubarak named his son in the honor of the former president. In 1972, Mubarak worked as Deputy Defense Minister in charge of reorganizing the Egyptian Air Force. The Yom Kippur War showed substantial progress in the development of the Egyptian Air Force, making Hosni Mubarak a national hero. Egypt's new President Anwar Sadat promoted him to the rank of Air Chief Marshal. In 1975, Anwar Sadat appointed him Vice-President. Mubarak was a real hero in the early 1970s. He was a fighting commander with an impeccable reputation, incorruptible and averse to any idols. It was then that he received the nickname of Mr. Integrity. Sadat's handpicked successor, Husni Mubarak, was overwhelmingly approved in a national referendum on October 24, 1981. Sadat appointed Mubarak vice president of the state in 1975 and of the NDP in 1978. Mubarak, who was born in 1928 in Lower Egypt and had spent his career in the armed forces, was not a member of the Free Officers' movement. He had trained as a pilot in the Soviet Union and became air force chief of staff in 1969 and deputy minister of war in 1972. In a speech to the People's Assembly in November 1981, Mubarak outlined the principles of his government's policy and spoke about the future he wanted for Egypt. Infitah would continue, and there would be no return to the restrictive days of Nasser. Mubarak called for an infitah of production, however, rather than of consumption, that would benefit all of society and not just the wealthy few. Food subsidies would remain, and imports of unnecessary luxury goods would be curtailed. Opposition parties would be allowed. The peace treaty with Israel would be observed. Thus, Mubarak sought to chart a middle course between the conflicting legacies of Nasser and Sadat. From 1981 onward, Mubarak allowed more overt political activity. Slowly, parties and newspapers began to function again, and political opponents jailed by Sadat were released. At the time of the 1984 election, five parties were allowed to function in addition to the ruling NDP. The left-wing opposition consisted of the National Progressive Unionist Party, a grouping of socialists led by Khalid Muhi ad Din, and the Socialist Labor Party. The Wafd resurfaced and won a court case against its prohibition. One religious party was licensed, the Umma. Not officially represented were the communists, the Muslim Brotherhood, and avowed Nasserites, although all three tendencies were represented in other parties. In the 1984 election, a party had to win at least 8 percent of the vote to be represented in the Assembly. The NDP received more than 70 percent of the vote (391 seats). The Wafd, the only other party to gain any seats, won fifty-seven. The NPUP received only 7 percent of the votes and consequently lost them all to the NDP. There were some complaints that the election was rigged, but no serious challenge was mounted against the results. In addition to domestic programs, Mubarak was concerned to regain the Sinai Peninsula for Egypt and to return his country to the Arab fold. One of Mubarak's first acts was to pledge to honor the peace treaty with Israel. In April 1982, the Israeli withdrawal from Sinai took place as scheduled. A multinational force of observers took up positions in Sinai to monitor the peace. Egypt was allowed to station only one army division in Sinai. In 1983, Egypt's isolation in the Arab world began to end. In that year, Arafat met Mubarak in Cairo after the PLO leader had been expelled from Lebanon under Syrian pressure. In January 1984, Egypt was readmitted unconditionally to the Islamic Conference Organization. In November 1987, an Arab summit resolution allowed the Arab countries to resume diplomatic relations with Egypt. This action was taken largely as a result of the Iran-Iraq War and Arab alarm over the Iranian offensive on Iraqi territories at the end of 1986 and throughout January and February 1987. On Egypt's side, its economic crisis worsened, and it needed economic assistance from the Arab oil states. Thus, the summit resolution amounted to an exchange of Egyptian security assistance in the Persian Gulf crisis for Arab aid to Egypt's economy. The summit indicated that Mubarak, in attempting to steer a middle course between the imposing legacies of Nasser and Sadat, had brought Egypt back into the Arab fold and into the center of Middle East peace making. From 1991 onward, Mubarak oversaw a domestic economic reform program to reduce the size of the public sector and expand the role of the private sector. There was less progress in political reform. The November 2000 People's Assembly elections saw 34 members of the opposition win seats in the 454-seat assembly, facing a clear majority of 388 ultimately affiliated with the ruling National Democratic Party (NDP). Opposition parties continued to face various difficulties in mounting credible electoral challenges to the NDP. The Muslim Brotherhood, founded in Egypt in 1928, remained an illegal organization and was not recognized as a political party (Egyptian law prohibited the formation of political parties based on religion until Mubarak was deposed in early 2011). Members were known publicly and openly speak their views, although they do not explicitly identify themselves as members of the organization. Members of the Brotherhood had been elected to the People's Assembly and local councils as independents, and also scored a major victory in 2005 parliamentary elections, winning 88 seats, thus forming the largest opposition group. Egypt's September 7, 2005 presidential election was the first in Egyptian history to be open to opposition candidates. As was widely expected, incumbent President Hosni Mubarak of the National Democratic Party won a fifth consecutive six-year term with 88 percent of the vote. Out of numerous opposition candidates, the two main challengers, Ayman Nour of the Al-Ghad party and Noaman Gomaa of Al-Wafd, received 7.3 percent and 2.8 percent of the vote, respectively. Although Mubarak received 88 percent of the vote, estimates were that only 15-23 percent of the 32 million registered voters participated in the election, meaning that Mubarak had the support of 6.5 million in a country of 72 million. As Mubarak approached his 83 birthday in 2011, he was in reasonably good health. His most notable problem was a hearing deficit in his left ear. He responded well to respect for Egypt and for his position, but was not swayed by personal flattery. Mubarak peppered his observations with anecdotes that demonstrated both his long experience and his sense of humor. During his 30 year tenure, he survived at least three assassination attempts, maintained peace with Israel, weathered two wars in Iraq and post-2003 regional instability, intermittent economic downturns, and a manageable but chronic internal terrorist threat. He was a tried and true realist, innately cautious and conservative, and had little time for idealistic goals. Mubarak was said to have had no single confidante or advisor who could truly speak for him, and he had prevented any of his main advisors from operating outside their strictly circumscribed spheres of power. Defense Minister Tantawi kept the Armed Forces appearing reasonably sharp and the officers satisfied with their perks and privileges, and Mubarak did not appear concerned that these forces were not well prepared to face 21st century external threats. EGIS Chief Omar Soliman and Interior Minister al-Adly kept the domestic beasts at bay, and Mubarak was not one to lose sleep over their tactics. Gamal Mubarak and a handful of economic ministers had input on economic and trade matters, but Mubarak was expected to likely resist further economic reform if he viewed it as potentially harmful to public order and stability. Dr. Zakaria Azmi and a few other senior NDP leaders managed the parliament and public politics. Mubarak was a classic Egyptian secularist who hated religious extremism and interference in politics. The Muslim Brothers represented the worst, as they challenged not only Mubarak's power, but his view of Egyptian interests. As with regional issues, Mubarak, sought to avoid conflict and spare his people from the violence he often predicted would emerge from unleashed personal and civil liberties. In Mubarak's mind, it was far better to let a few individuals suffer than risk chaos for society as a whole. He had been supportive of improvements in human rights in areas that did not affect public security or stability. Mrs. Mubarak had been given a great deal of room to maneuver to advance women's and children's rights and to confront some traditional practices that had been championed by the Islamists, such as FGM, child labor, and restrictive personal status laws. The next presidential elections were scheduled for September 2011, and it was long expected that if Mubarak was still alive he would run again, and, inevitably, win. When asked about succession, prior to the events of January 2011 he had stated that the process would follow the Egyptian constitution. Despite incessant whispered discussions, no one in Egypt had any certainty about who would eventually succeed Mubarak nor under what circumstances. Prior to 2011 the most likely contender was presidential son Gamal Mubarak (whose profile was ever-increasing at the ruling party); some suggested that intelligence chief Omar Soliman might seek the office, or dark horse Arab League Secretary-General Amre Moussa might run. Mubarak's ideal of a strong but fair leader was seen to discount Gamal Mubarak to some degree, given Gamal's lack of military experience, and could have explained Mubarak's hands off approach to the succession question. Indeed, he seemed to be trusting to God and the ubiquitous military and civilian security services to ensure an orderly transition. In an interview on February 3, 2011 with ABC News correspondent Christiane Amanpour, Egyptian President Hosni Mubarak said he was fed up with being the country's leader and would like to leave now, but feared Egypt would sink deeper into chaos if he did. On Tuesday 01 February 2011 President Hosni Mubarak announced that he would not seek another term in office, amid mass demonstrations demanding that he step down immediately. A number of world powers have urged Egypt to step up its timetable for a political transition. U.S. President Barack Obama said Tuesday that Mr. Mubarak recognizes that the "status quo is not sustainable." Mr. Obama also said he had told the Egyptian president that an orderly transition "must be peaceful and must begin now." On Wednesday, EU foreign policy chief Catherine Ashton urged Mr. Mubarak to respond quickly to anti-government protesters seeking the transition. The EU issued a statement calling on Egypt to begin an "orderly transition" with reforms that include "free and fair elections." On 11 February 2011 President Mubark resigned. The announcement came from Vice-President Omar Suleiman, who announced that military forces will now take over. The announcement on state television came as hundreds of thousands of anti-government demonstrators spread out across Cairo and other Egyptian cities, after Mubarak refused their demands to resign immediately. Mubarak and his family left Cairo, arriving just before sundown in the Egyptian resort town of Sharm el-Sheikh, where he has a resort home. In the end, it took just eighteen days to bring down a 30-year-old regime, but the anger that drove Egyptians into the street had been building for years. What began as a youth movement on January 25 quickly grew into a popular, leaderless uprising that expanded as the days went by. After being ousted from power, Mubarak was subsequently put on trial for various crimes allegedly committed during mass protests in early 2011. On 02 June 2012, Mubarak was sentenced to life in prison for failing to stop the killing of protesters. Other officials tried with Mubarak were acquitted, sparking renewed protests. That sentence was later overturned by an appeals court on a technicality. Mubarak's Islamist successor Mohammad Morsi, who was himself toppled by Field Marshal Abdel Fattah al-Sisi in July 2013. On 28 NOvember 2014 an Egyptian court found former Mubarak not guilty of conspiring to kill hundreds of protesters during the 2011 uprising, which led to his ouster. He was further exonerated on separate corruption charges. Judge al-Rashidi said the charges had been politically motivated and did not deserve to be tried in his court. Mubarak's interior minister Habib el-Adly and six aides were also found not guilty of conspiracy to commit murder. The court further found that neither Mubarak, his aides, nor his two sons, Gamal and Alaa, were guilty of corruption charges stemming from a controversial gas deal with Israel. Despite the verdict, Mubarak was not released from prison immediately, as he was serving a 3-year sentence for embezzling public funds. Hosni Mubarak was freed 24 March 2017 after being detained in prisons and hospitals for six years, following the Arab Spring uprising in 2011. 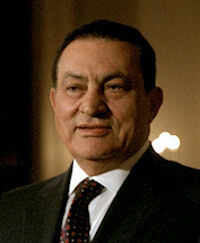 Mubarak was the first leader to face trial after the Arab Spring uprisings that swept the region. He was accused of inciting the deaths of protesters in the 18-day revolt. He also faced a number of other charges that eventually were dismissed. In March 2017, he was cleared of the murder charges. Mubarak's lawyer confirmed that the former leader was now ensconced at home in the upscale Heliopolis neighborhood.